It is with deep regret that I have to inform you that Arthur Parker died yesterday evening in hospital following a short illness. Arthur had been a member of Bishop's Stortford Bowling Club for over 40 years. During that time he had been President, had contributed much to the club and was a Life Member. His involvement in bowls extended well beyond the club. 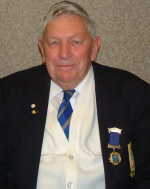 He was a past President and a Life Member of EHBA and his bowling at County level meant he was widely known across Hertfordshire. As a result I would ask that members communicate the sad news of his death to the wider bowling community. We will pass on details of the funeral arrangements as soon as we have them.